Global neuroscience market expected to reach approximately USD 34,800 million by 2024 and is growing at a CAGR of more than 3.5% between 2017 and 2024. 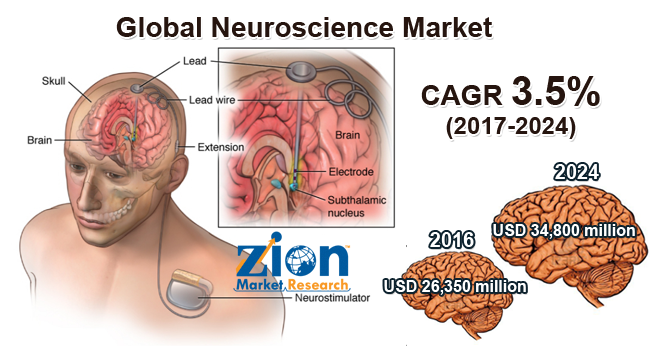 The increase in the number of central nervous system (CNS) diseases and the growth in the advanced technological advancements are the primary factors that are driving the neuroscience market. The neuroscience market has been analyzed using Porter’s Five Forces Analysis. The rise in the occurrences of the neurological disorders globally has triggered the growth of the neuroscience market. There has been a rapid increase in the cases of neurological disorders such as cerebral stroke, Alzheimer's disease, epilepsy, and Parkinsonism which has increased the demand for the developments in the field of neuroscience. The demand for the CNS-related diagnostic procedures has increased which has positively affected the growth of the market. Other factors that are expected to drive the market growth positively are favorable reimbursement policies and the growing government spending on the healthcare infrastructure. By component, the instrument segment accounted for the largest market share in 2016. In instruments segment, the components such as MRI imaging systems, neuro – microscopy, and others accounted for the largest market share. The high cost of these instruments has contributed to the increased revenue contribution of this segment in the neuroscience market. Owing to the increased use of the instruments for the diagnosis and treatment of the neurological disorders has positively affected the growth of the instruments segment.